(Nanowerk News) An aggressive form of breast cancer known as “triple negative” is very difficult to treat: Chemotherapy can shrink such tumors for a while, but in many patients they grow back and gain resistance to the original drugs. 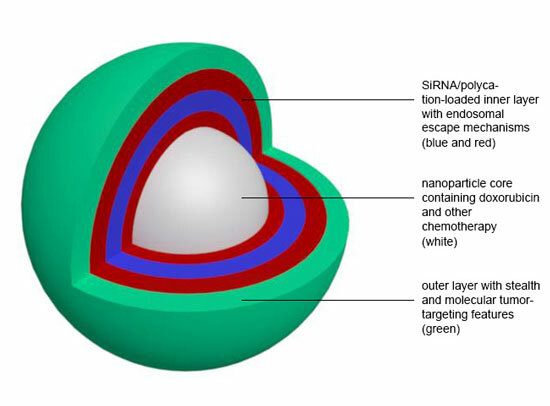 Using these particles, the researchers were able to shrink triple-negative breast tumors in mice, they report in the Oct. 21 online edition of the journal ACS Nano ("Layer-by-Layer Nanoparticles for Systemic Codelivery of an Anticancer Drug and siRNA for Potential Triple-Negative Breast Cancer Treatment"). The particles could also be customized to treat other types of cancers, the researchers say.